June 1980 (felt like '79 though). Me and the boys were the tough kids who ruled the playground and tried to rule the classroom--and the principal's office (never understood that spelling trick about how the principal is your "pal"). 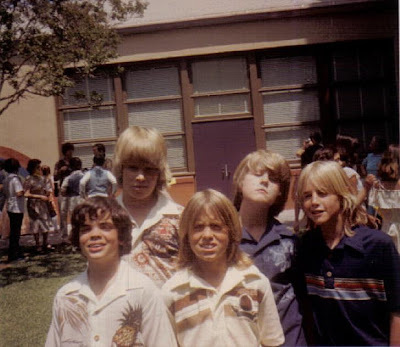 Note the OP and Lightning Bolt shirts (you'd also see Vans shoes) along with my sun bleached surfer hair (yes, that's me on the far right). I'm in contact with everyone on the list except Greg, although I saw him at the 20-year reunion [strike that, just caught up with him on Facebook]. John actually lives nearby (Big Bear). P.S. Dad, I have a drum set now if you want to come listen.